Myulchi bokkeum (or myeolchi bokkeum) is a popular side dish (banchan) in Korea. 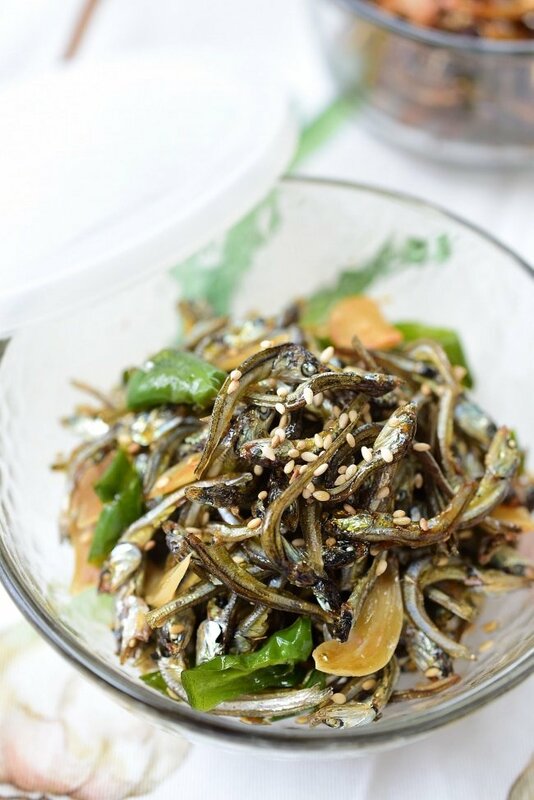 The stir-fried anchovies are sweet, savory, sticky and crunchy! This easy recipe also shows how to make it a bit spicy. 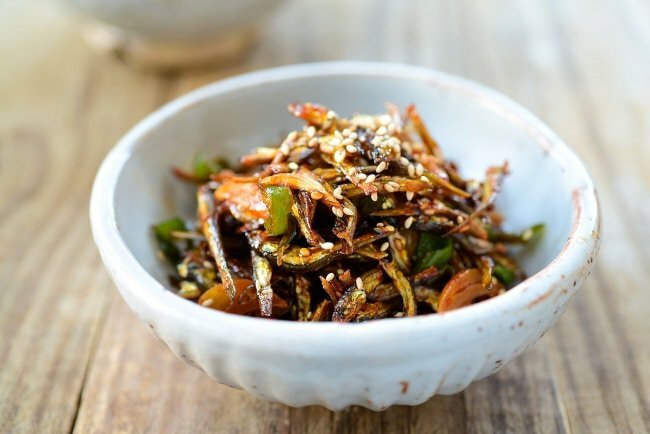 Myulchi bokkeum (멸치볶음), stir-fried dried anchovies, is a staple side dish in Korea. It’s one of the most common basic side dishes, called mitbanchan (밑반찬). Basic side dishes are made to last long and served with every meal, including home-packed school lunch boxes. 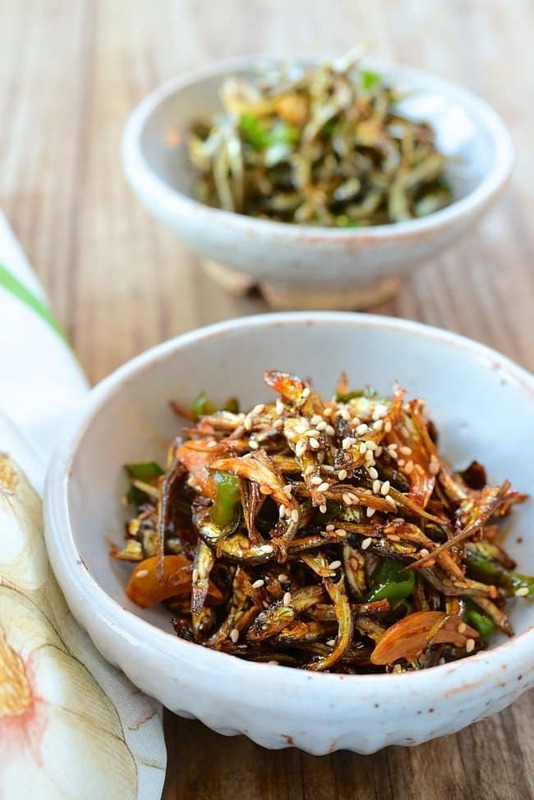 Korean stir-fried anchovies are sweet, savory, sticky and crunchy! This recipe shows two ways to prepare myulchi bokkeum – mild and spicy. 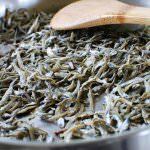 As explained in my Anchovy Stock for Korean Cooking post, dried anchovies (myulchi or myeolchi, 멸치) come in a wide range of qualities and sizes. If you visit traditional markets in Korea, you can easily find big piles of different sizes of dried anchovies on display everywhere. Buy the best quality anchovies you can find. These anchovies are a staple in my freezer. Dried anchovies are best kept in the freezer. Medium to large anchovies are primarily used to make broth, gukmul yong (국물용). Smaller ones are used for various stir-fried or braised side dishes and usually labeled bokkeum yong (볶음용). The smallest, tiny anchovies are called jiri myulchi (지리멸치). You can use any small dried anchovies for this recipe. Anchovies are high in nutrition, so Korean moms encourage their kids to eat more anchovies. They are an excellent source of calcium, protein, Omega 3 fat, etc. My kids didn’t favor them when they were little, but they both eventually acquired the taste. 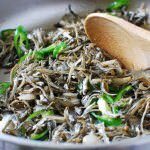 Now, these stir-fried anchovies are among the regular side dishes I prepare to bring with me when I visit them. You don’t need to remove the guts and/or the heads from small anchovies before using them. They are all edible. If you are sensitive to a fishy taste, you can pan-fry the anchovies for a couple of minutes in a heated dry pan before using them. This will remove some of the fishy taste. To make myulchi bokkeum, stir-fry the dried anchovies in a little bit of oil, and then mix them in a thickened sweet and savory sauce. You can give them a spicy kick by using some gochujang (Korean red chili pepper paste). Dried anchovies are naturally salty, so don’t over season them. This myulchi bokkeum recipe was originally posted in September 2011. I’ve updated it here with an improved recipe, more information, and new photos. 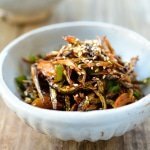 Have you tried this Korean stir-fried anchovies recipe? Please rate the recipe below by either clicking the stars or leaving a comment! And make sure to share your creations by tagging me on Instagram! Stay in touch by following me on Pinterest, Twitter, Facebook, and Instagram. Myulchi bokkeum, stir-fried dried anchovies, is a popular side dish (banchan) in Korea. The stir-fried anchovies are sweet, savory, sticky and crunchy! This easy recipe also shows how to make it a bit spicy. Heat a pan with the oil over medium heat. Add the anchovies and stir fry for 2 – 3 minutes. Turn off the heat. Transfer to a plate. Add the seasoning ingredients, except sesame oil and seeds, to the pan. If using the spicy version, stir the sauce well to dissolve the gochujang. Turn the heat back on. Boil the sauce over medium heat until it bubbles up and slightly thickens, about 2 – 3 minutes. Add the anchovies and the optional chili peppers to the pan. 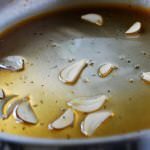 Stir well until the anchovies are coated well with the sauce. Stir in the sesame oil and sesame seeds at the end. Myulchi bokkeum can keep well up to a week in the fridge. The post Myulchi Bokkeum (Stir-fried Anchovies) appeared first on Korean Bapsang. © 2018. All rights reserved. Rising Grill Korean BBQ powered and maintained by Flutterworks Web Design.